Now is an exciting time to be going to Cuba and the brigade gives a unique opportunity to speak to Cubans from all walks of life, see the reality of life under the ongoing US blockade, and learn about the country’s economic and social development. Work alongside Cuban farmers as well as participate in a full programme of talks, meetings with representatives of mass organisations and visits to community and cultural projects, with time to relax at night with a cool Mojito. Mostly based near Havana but also visit to other parts of the island during these brigades. In 2019 Cuba celebrates the 60th anniversary of the revolution. Summer 2019 Solidarity Brigade will visit Matanzas province. 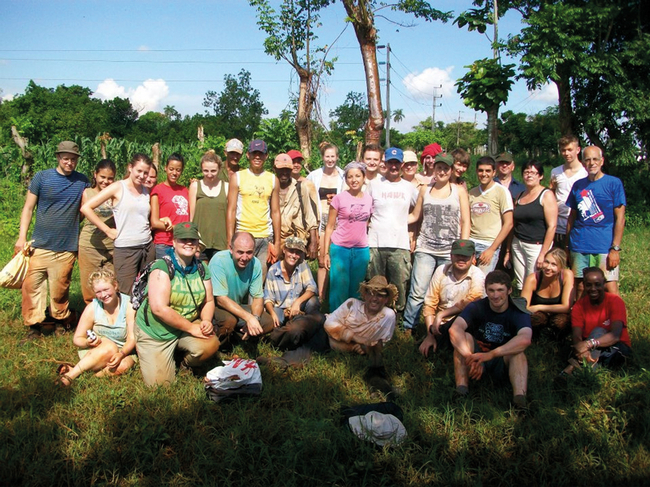 Summer 2019 brigade programme includes working in a rural area outside Havana alongside local farmers, as well as visits to a policlinic, museums and historical sites, a local community organisation and an environmental project, plus talks on the current challenges of the US blockade, the economy, participative democracy and the electoral system, with opportunities to meet local councillors and to discuss international solidarity. The group also expect to meet representatives of youth mass organisations such as the student unions, plus representatives of the Womens Federation and Trade Unionists, and young musician groups. With free time to explore the capital and lots of opportunities to soak up the culture, with dance classes and live music. Not forgetting some time at amazing beaches. This brigade also includes a 3 day trip to Matanzas province – including a visit to the historical site of Playa Girón (Bay of Pigs). Cost includes programme of talks, events and visits, accommodation, transport, food and preparation pack in advance of departure. You need to organise your own international flights but we can assist with this. If you are not already a member, you will get free membership of CSC for one year if you participate in the brigade. To apply, download the application form and send it to CSC, c/o Unite, 33-37 Moreland Street, London EC1V 8BB with your £100 deposit. You can pay the deposit by cheque payable to CSC, or call us to pay by card or bank transfer. For more information contact tours@cuba-solidarity.org.uk or telephone 020 7490 5715.